In iCarol, there are five security levels available for users in your system; Trainee, Standard, Enhanced, Supervisor and Admin. Each of these levels enables users to see and use a particular set of tools and functions in iCarol. Further to this, using Advanced Security settings, you can fine-tune exactly which tools and functions each user can see and use. This article will provide an overview of the Security Levels, and definitions of the settings found in Advanced Security Settings. In general, Admins are the highest security level and can see and use all tools and functions in iCarol by default, with some exceptions that will be pointed out later in this article. Supervisors can see and use everything Admins can, except sending welcome emails to new users and accessing the Admin Tools menu. Again, as with Admin, there are a few exceptions that will be pointed out. Enhanced and Standard users have access to fewer tools and functions, and Trainees have access to very few tools and functions. Many of the Advanced Security settings are self-explanatory. Those that are not or where additional information may be helpful to understand what the setting enables will be noted here. Allowed to access Call Reports and Repeat Callers – This is the setting that enables the user to see “Calls” in the left hand menu, and therefore view and submit call reports. Can give feedback on call reports – This setting enables the user to see and use the “Feedback” text box in call reports to provide feedback to the user who submitted the call report. Can review call reports – If you have enabled the function that staff can mark call reports as “reviewed for accuracy”, this setting allows the user to see and use the “Report has been reviewed for accuracy” check box at the bottom of call reports when viewing them. Can only see call reports submitted by themselves – When the user views the “All Calls” page, only call reports they have submitted will appear in the list of submitted call reports. Further, this means they can only view the details of call reports they have submitted themselves. Can access Specialized Call Export Tool – This is an add-on feature that enables the creation of resource lists in Word or Excel format. This setting enables users who are not Admins to use this tool. Can certify computers – If you are using Restriction and Certification, this setting enables non-Admins to user the Certification tool to certify a computer. 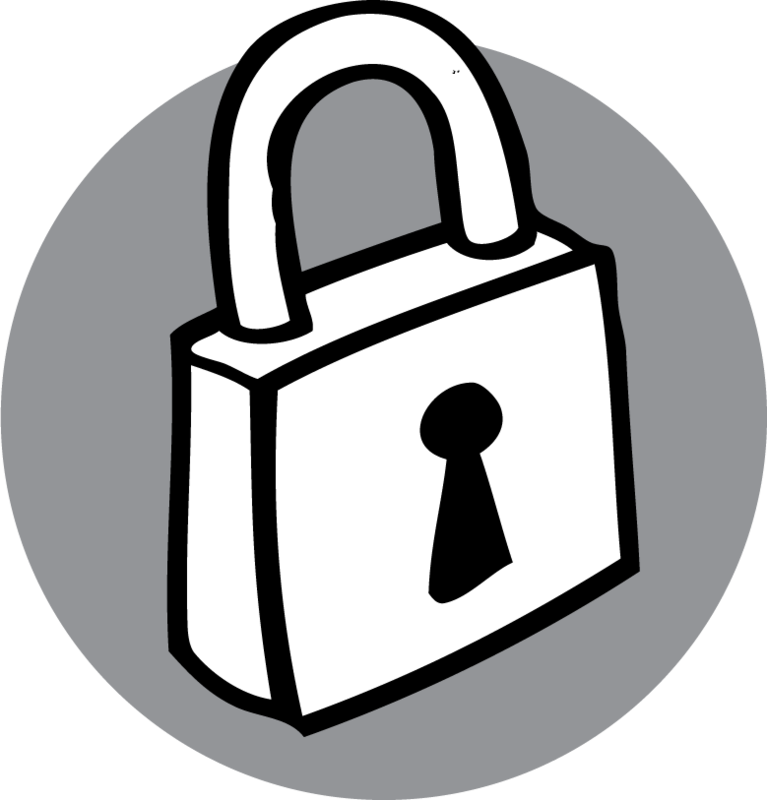 Exempt from Restriction – If you are using Restriction and Certification, and the user belongs to a Security Level that is restricted; this setting exempts them from restriction. Depending on settings made on the Tools tab of Admin Tools, Restriction may also apply to Admins and Supervisors. If this is true, to exempt a particular Admin or Supervisor from Restriction, this setting must be manually checked. Can only see call reports for programs to which they belong – This setting only appears if you are using the add-on feature Programs. This is the setting that restricts users to only seeing call reports that belong to the same programs they do. Can only see caller profiles for programs to which they belong – This setting only appears if you are using the add-on feature Programs. This setting restricts which repeat callers the user can see and choose for use in a call report. Please note: This setting is not given to any Security Level by default. Therefore, if a user needs this setting, it must be manually checked. Can use Call Reports residing in other iCarol system – This setting only appears if a caller report from another iCarol system is being shared with your system. This setting enables the user to see and create call reports using the shared call report. Please note: This setting is not given to any Security Level by default. Therefore, if a user needs this setting, it must be manually checked. Can access Outbound Calls – This setting enables the user to see the Outbound Calls button on the main Calls page, if this tool is turned on in the system. Can only access Outbound Calls, but not see Call Reports – If a user should only have access to the Outbound calls tool, and should not be able to see and use Call Reports, check this setting. Allowed to access Shifts – this is the setting that enables the user to see “Shifts” in the left hand menu, and therefore view the shift calendar and sign up for shifts. Hide the list of people currently in On Call shifts, on the main Calls page – If this setting is unchecked, at the top of the Calls page will be a list showing who is currently signed up for On Call shifts. If this setting is checked, this will not show. Can only see shifts for programs to which they belong – This setting only appears if you are using the add-on feature Programs. This setting restricts which shifts the user sees on the shift calendar to just those that are for the programs he or she belongs to. Allowed to access Resources – this is the setting that enables the user to see “Resources” in the left hand menu, and therefore view and search Resources through that link and through the call report form. Can activate/inactive resources – this refers to the “Status” field in resource records. This setting enables users to change to status to and from Active, Inactive, and Active but do not refer. Can approve resource changes – This setting only applies to those systems using Workflow rules for the resource database. Can QA resources – This setting only applies to those systems using Workflow rules for the resource database. Can access verification – This setting enables the user to use the Automated Verification add-on feature. Data export options – As noted at the top of this section, if any of these are selected, the person can access the Data Export tool from the bottom of the home page inside of iCarol. Can always see the full names of staff and volunteers – This setting applies when Admins have made changes to the way user names are displayed in iCarol via the Vols and Staff tab in Admin tools. 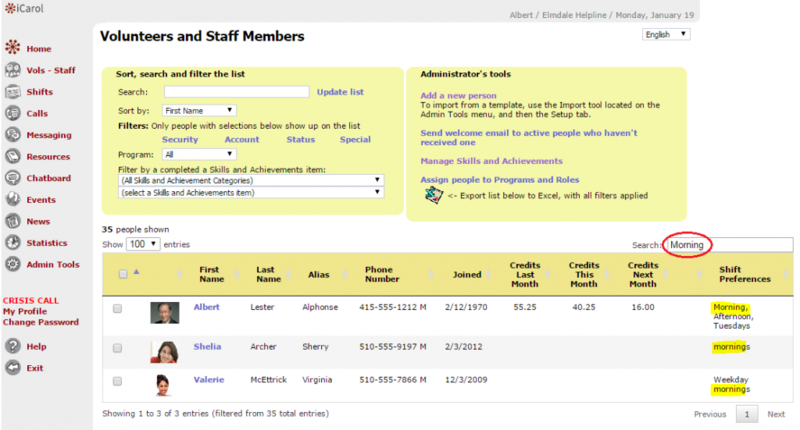 Allowed to access Vols and Staff – this is the setting that enables the user to see “Vols-Staff” in the left hand menu, and therefore view the list of users in the system. Allowed to access Chatboard – this is the setting that enables the user to see “Chatboard” in the left hand menu, and therefore view and post messages to the Chatboard. Allowed to access Internal Chat – this is the setting that enables the user to see “Internal Chat” in the lower right hand corner of the screen when logged into iCarol, and therefore use this tool to chat with other users that are logged in. Please note: This setting is not given to any Security Level by default. Therefore, if a user needs this setting, it must be manually checked. Alternatively, this option can be checked for everyone by using the “Enable Internal Chat for Everyone” link on the Vols and Staff tab of Admin Tools. Allowed to access Events – this is the setting that enables the user to see “Events” in the left hand menu, and therefore view the Events calendar. Allowed to access News & Fun – this is the setting that enables the user to see “News” in the left hand menu, and therefore view the News page. Statistics – With this drop-down menu, a user can be given access to see “Statistics” in the left hand menu, and therefore run various reports with this tool. Can receive Instant Messages in iCarol – This setting will only appear if you are using the instant messaging/chat add-on feature. This setting enables the user to assume and respond to chat conversations from the Messaging page. Please note: This setting is not given to any Security Level by default. Therefore, if a user needs this setting, it must be manually checked. Can receive Texting/SMS Messages in iCarol – This setting will only appear if you are using the texting/SMS add-on feature. This setting enables the user to assume and respond to SMS conversations from the Messaging page. Please note: This setting is not given to any Security Level by default. Therefore, if a user needs this setting, it must be manually checked. If you have any questions at any time about Security Level or Advanced Security Settings, please do not hesitate to submit a case to the iCarol Support Team via the Online Case Management tool. On the heels of Internal Chat we’re introducing yet another Volunteer and Staff feature. We’ve recently enhanced the ability to search and sort on the Volunteer and Staff page. You can use the new “Search” function on the right, just above the list of users, to search for specific names, aliases, preferred shift types and times, and more. A companion feature lets Admins create checkboxes for shift preferences. Those shift preferences can then be selected in each person’s profile. In this way, you could note, for example, who likes chat shifts, who is available filling in at the last minute, or who likes to work Tuesday afternoons. Admins set up those checkboxes in the Shifts tab in Admin Tools. We sure hope you enjoy these new enhancements and that they increase the efficiency with which you complete volunteer and staff related administrative tasks. Whether it’s more easily finding the volunteer profile you need to access, quickly adding a new skill or achievement to a group of folks who attended the same training, or speedily locating all the volunteers who can potentially help fill a morning shift, we think you’ll make great use out of these enhancements and that they will save you some extra time and clicks as you navigate through iCarol.